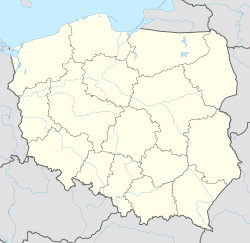 Tworóg [ˈtfɔruk] (German: Tworog) is a village in Tarnowskie Góry County, Silesian Voivodeship, in southern Poland. It is the seat of the gmina (administrative district) called Gmina Tworóg. It lies approximately 15 kilometres (9 mi) north-west of Tarnowskie Góry and 38 km (24 mi) north-west of the regional capital Katowice. The village has a population of 3,500. This Tarnowskie Góry County location article is a stub. You can help Wikipedia by expanding it. This page was last edited on 14 July 2017, at 23:22 (UTC).